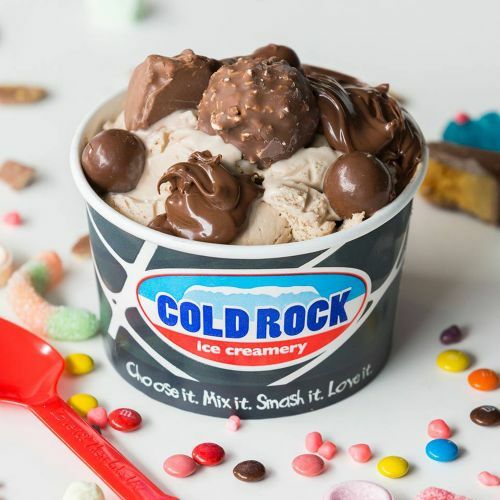 Menulog delivers for Cold Rock - Gungahlin so you'll be able to track your courier on a map. Double choc ice cream with brownie, mini M&M’s and boost. Strawberry ice cream and cherry ripe, boysenberries and strawberries. • Cookie Jar = Cookies and cream ice cream cake topped with cookie doe, Tim Tam and Oreo cookie. • Peanut Butter Time = Caramel ice cream cake topped with Reese's peanut butter cups, flake and Mars Bar. • Bubble Gum Buzz = Bubblegum ice cream cake topped with Nerds, mini marshmallows and Gummy Bears. Mini = Serves 1 to 4. Small = Serves 8 to 12, Regular = Serves 15 to 20, Large = Serves 25 to 30. The perfect way to indulge and cool off in the heat! Spiders are served with your choice of ice cream and soft drink and whipped cream on top. 8 different scoops of our amazing range of ice creams and sorbets. 16 different scoops of our amazing range of ice creams and sorbets. Waffles are served hot in a take away box with a scoop of ice cream in a cup. Topping is served in a a take away cup, mix in is served in a take away cup. One flavour of ice cream, one mix in and one topping. Two hot pieces of browning between two scoops of ice cream smothered in hot chocolate or caramel topping. • Cookie Jar - Cookies and cream ice cream with Oreo, Tim Tam and cookie dough. • Death by Chocolate - Double choc ice cream with brownie, mini M&M’s and boost. • After Dinner Mint - Mint ice cream with mint slice, brownie and Kit Kat. • Bubblegum Buzz - Bubblegum ice cream with Nerds, Gummy Bears and mini marshmallows. • Caramel Crazed - Caramel ice cream with Picnic, Crunchie and Mars Bar. • Animals Alive - Aussie vanilla ice cream with Gummy Bears, Caramello Koala and Freddo Frog. • Berry Cherry Dream - Strawberry ice cream and cherry ripe, boysenberries and strawberries. • For-A-Rare-Share - Ferraro ice cream with Ferrero Rocher, Nutella and Picnic. • Peanut Butter Time - Salted caramel ice cream with Picnic, Mars Bar and Reese's pieces.